Witch finger cookies is one such fancy and spooky cookies made with basic sugar cookies dough. Yes you heard it right! 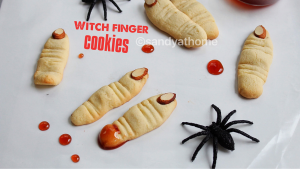 These finger cookies are super easy to achieve and yummy to taste. It does not take much time to make it as needs no dough refrigeration also needs no special cutters/ molds too. Sounds great right! 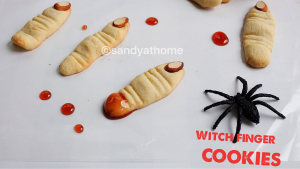 I made these cookies last year for Halloween at home and everybody loved it, that time I did not picture it, I made these cookies again this time to post it in the blog. 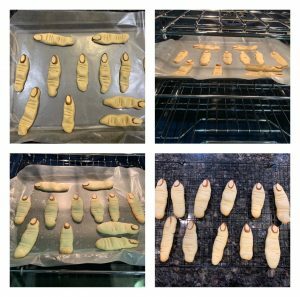 These cookies are supposedly to be in green color to denote exact witch fingers since I don’t like adding artificial color to my foods I avoided it , but just for one day its actually okay but since I was not convinced I skipped that part. But if you presenting it in a Halloween party adding color would be great idea and kids can get spooked. So for the blood part in the picture I used regular fruit jam which gave me realistic look. 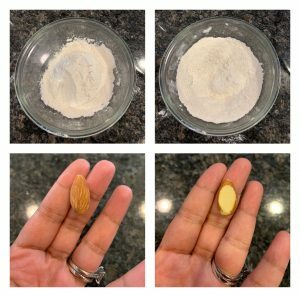 I used almonds as nails which actually adds to the cookie taste. 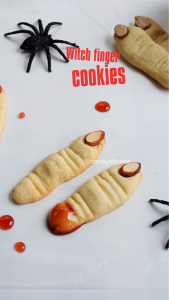 So if you are planning to host a Halloween party this time try these cookies and I sure everyone will like it. So lets get to the making! In a bowl add all purpose flour, salt, and baking powder. Mix well until combined. Keep this aside. Slice the almonds as shown in the collage and keep it aside. In another wide bowl add sugar and melted butter. 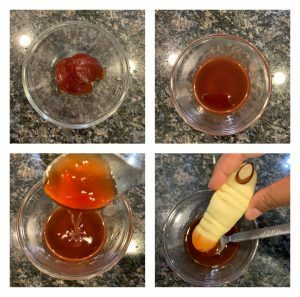 Blend it well until creamy and combined. This should take about a minute. 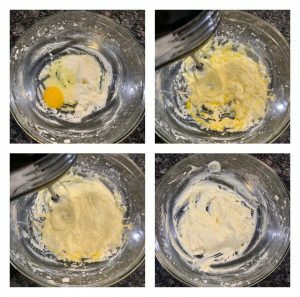 Now break 1 egg and vanilla syrup in the same bowl. Whisk it well until combined. Now to this wet mixture add the flour mixture through a sieve. 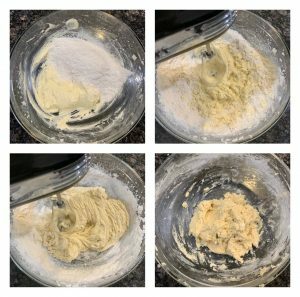 Mix well and it will slowly form a soft dough. Preheat oven at 350F/ 180C . Place a butter paper/ wax paper/ parchment paper on a baking tray. 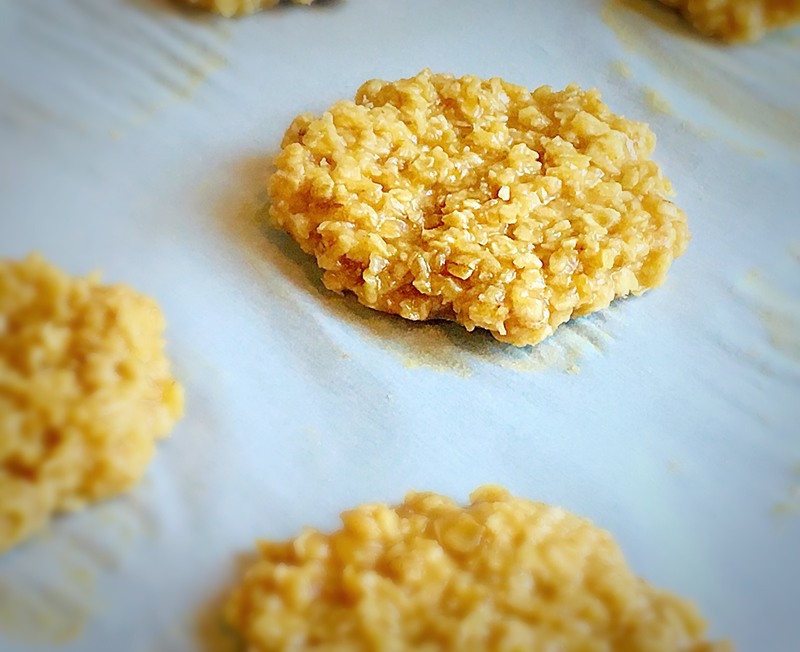 Now pinch a small portion if cookie dough, make it into a long finger shape and then flatten it gently and keep it on the baking tray with parchment paper. Now using a toothpick make lines/ deep cut just our fingers. Then place the sliced almonds as nails. Repeat the process till all the dough us complete. Make sure to place the flattened cookies one by one with enough spacing between each cookie. Place the baking tray in the oven and bake the cookies/ biscuits for 15 minutes or till cookies are done. When sides are browned remove the biscuits from oven, place it on a cooling tray for it to cool down. When the biscuits have cooled serve them with tea/ coffee and store the remaining cookies in air tight container. In a bowl add all purpose flour, salt, and baking powder. Mix well until combined. Keep this aside. Slice the almonds as shown in the collage and keep it aside. In another wide bowl add sugar and melted butter. 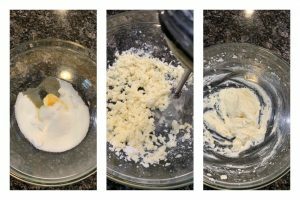 Blend it well until creamy and combined. This should take about a minute. Now break 1 egg and add vanilla syrup in the same bowl. Whisk it well until combined. Now to this wet mixture add the flour mixture through a sieve.Mix well and it will slowly form a soft dough. Preheat oven at 350F/ 180C . Place a butter paper/ wax paper/ parchment paper on a baking tray. 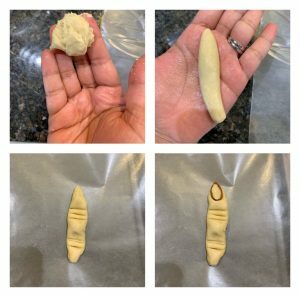 Now pinch a small portion if cookie dough, make it into a long finger shape and then flatten it gently and keep it on the baking tray with parchment paper. Now using a toothpick make lines/ deep cut just our fingers. Then place the sliced almonds as nails. Repeat the process till all the dough us complete. Make sure to place the flattened cookies one by one with enough spacing between each cookie. Place the baking tray in the oven and bake the cookies/ biscuits for 15 minutes or till cookies are done. (I made 2 batches that’s why there is less in this tray) When sides are browned remove the biscuits from oven, place it on a cooling tray for it to cool down. In a microwave safe bowl heat jam for 15 seconds until watery. When the biscuits have cooled dip it in jam and serve them. Store the remaining cookies that’s not dipped in jam in air tight container.